We went out with Offshore Hustler last weekend - my family had a great time, caught a lot of fish. I have never fished before and even I was able to pull up keeper grouper. The kids had a great time. Pete and his deckhand were very knowledgeable and helpful. All in all we had a positive experience. Deciding to book The Offshore Hustler was one of the best decisions I've made in a while. Captain Pete and his deck hand were extremely knowledgeable, courteous and accommodating. We booked an 8 hour trip to kick start my bachelor party weekend. We caught an amazing amount of fish like, barracuda, red grouper, gag grouper, porgies and even an 8 ft. nurse shark. They baited our hooks, cleaned our fish and most importantly made sure we had a blast! I can't wait to book another charter with the Offshore Hustler! Thanks a lot for a weekend I'll never forget! We had a wonderful time with Capt. Pete and Cody on 5/18/13. They were so accommodating and enjoyable. We did the 6 hour trip and caught many more fish than we ever thought possible. Some huge Grouper, a lot of Snapper and a few Porgies. Cody was nice enough to fillet the fish and we took it back to our hotel to eat. It was a wonderful time. Next time, we want to try the 10 hour trip. Attaching a few highlight pics of our AWESOME!!! fishing trip. Our boys can't stop talking about, and I quote, "The best day of my life". We had so much fun and will definitely be back soon! The day was the highlight of our trip. Thanks for the super memories!! As usual, everything was great and we had an awesome time on our last trip. It was good to have Cody back on the boat... he's a lot of fun and we really enjoy him. I know Pete and Cody really love what they're doing and boy do they bust their asses all day! They don’t stop for a minute... I don’t know how they do it 6 or 7 days a week! Thanks again for everything and we'll be in touch again soon. We have been out with Offshore Hustler twice and had a great experience both times. We reached our limit on both trips and brought back enough fish to last a couple of months. Capt. Pete was great at finding fish and is also an all-around good guy with a great sense of humor. We've done the 8 hr. and 10 hr. trip and we would definitely recommend the 10 hr. trip. We will definitely be back and wouldn't even consider going with another charter. I had purchased a fishing charter for my twins’ birthday - they turned 27. Both work really hard. One is a police officer and the other one a firefighter/paramedic. They love fishing. Wanted to get them out of their norm for a few hours. They left the dock on Wednesday. July 11, at 7 am. One of my sons did not have a hat and the captain gave my son a visor. He loves it. The captain proceeded on the trip and my kids enjoyed themselves tremendously. There are no words to describe how much fun they had catching fish. My kids said they were actually getting tired of reeling them in. They had so much fun and I wanted to thank Captain Pete and the staff at Offshore Hustler. Professionalism and knowledge and just all around good time is what 3 words I would describe the trip. They had a blast and are already taking about their next trip. Would most highly recommend the Offshore Hustler fishing charters. Would most highly recommend to family friends and fishing enthusiasts young and old. Memories they will never forget. To close, we went back to our condo and had a cookout.. Their recipes for our grouper and red snapper were.. YummYYYYYY!!! Thanks so much and we will see you in the future. I’ve been booking charters with Offshore Hustler for the last three years; Captain Pete never fails to deliver not only the fish, but a really awesome time. Instantly, Offshore Hustler impressed my party and I with their efficient professional manner from booking to boarding. Captain Pete and his staff’s approach not only inspired confidence but generate the results we were looking for on the trip. 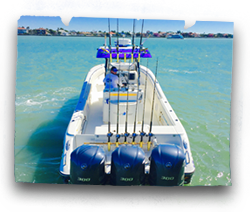 For a truly memorable fishing charter in the Gulf, look no further than Offshore Hustler! My family and I go fishing every year on the Offshore Hustler while there on vacation and it is definitely worth it. Captain Pete and Billy were very helpful and informative, and fun to fish with. We caught so many fish my arm was sore! I would highly recommend booking your next fishing trip with Offshore Hustler! Thanks to Captain Pete from Texas. 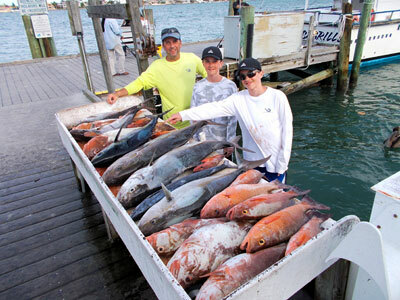 Captain Pete’s Offshore Hustler Fishing Charters are a wonderful fishing experience. My friends and I when we have gone on his Charters always caught out limit of good sized fish. Have been out with Captain Pete three times and this last time caught a 50 lb. Gag Grouper. Unfortunately, it was not “in-season” so I had to throw him back but was able to take home lots of other fish which were in-season. I always refer people to Captain Pete’s boat and they rave about their fishing trip. My last trip was April 2, 2012 and two other trips in 2011 and 2010. I took my son, dad and father-in-law to Florida for an offshore trip with Capt. Pete and first mate Bill. The boat was great and they provided everything we needed for an enjoyable day of fishing. We caught large amounts of red grouper and porgy. Everyone still talks about the experience and we can't wait for next time. Thanks Capt. Pete! High quality experience! 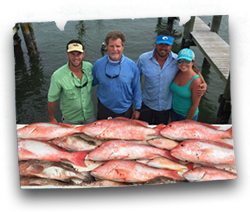 From the time you make your reservation, to the last fish is filleted, the staff of the Offshore Hustler provide nothing less than the highest quality experience you will never forget! I have recommended them to family and friends, and they didn’t disappoint them at all. 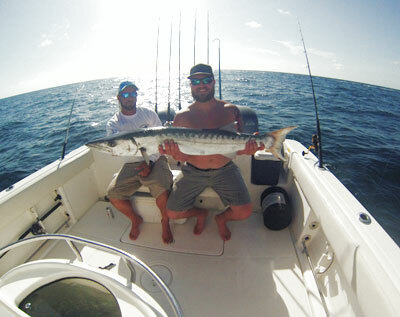 If you are looking to catch a lot of quality fish, this is the charter to choose. We’ve always come home with a boat load of fish and memories that will last forever! We look forward to the next trip with Capt. Pete, and the Offshore Hustler! June 2011 – 12 hr charter. June 2012 – 12 hr charter. Booked September 2012 – 8 hr charter. We had the opportunity to fish with Capt. Pete on the Offshore Hustler on June 13, 2012. It was an excellent experience that started with booking the trip with Jackie, to fishing and filleting. This is professional family operated business. They immediately respond to questions both on-line and by phone. They make recommendations on the length of trip based on the number of anglers and open fisheries which saved us money and time, yet we still caught plenty of fish and returned to the dock tired from fighting fish. They know the area well and make recommendations for lodging. Capt. Pete is a pleasure to fish with. He handles his boat and equipment well and generally knows what type of fish you will catch at each of his spots. His system is simple and easy to pick up. Most importantly he is even tempered and fun to fish with. He was training a new deck hand and never lost his patience even when there were unforeseen challenges. There was never any yelling or stress. And most importantly we had a great time and caught plenty of fish, the first being a 20 lb. plus red snapper. We have been chartering at least once a year for the last 20 years, plus running our own boats even longer. 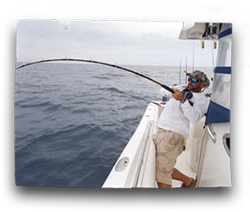 We would recommend Offshore Hustler Charters to all from the most novice to expert fishermen. I found about the offshore hustler charter by taking a different charter out of St. Pete and decided to check out their website afterwards. I was amazed by the amount of fish caught based on the pictures and decided that we would give them a try on our next trip. My first trip on the charter was an 8 hr. adventure of non-stop action back in April 2010. Everyone who went was tired after such an awesome time fishing. I have since then taken this charter since totaling 5 trips with the latest being 7/9/12. Capt. Pete is very knowledgeable of the grounds and his crew is very professional. They make sure you catch fish and have a good time while ensuring your safety in the event of thunderstorms that may pop up while fishing. I will continue to support and stand by the side of Offshore Hustler Charters!!! Thanks for everything and keep up the good work!!! Capt Pete put us on the fish. His knowledge of the area and his boating skills are unmatched. We limited out on gag grouper. Each stop produced fish a lot of fish. This was a great trip and matches any trip I have taken to the middle grounds. We were very pleased with all aspects of this trip and will only charter with Offshore Hustler in the future. I highly recommend this charter and firmly believe anyone would be happy with the hard work and dedication these guys put forth to make the trip a remarkable success.